Do you update your Instagram followers about new products, blog posts and other content? It’s irritating not being able to add a link to your latest blog or product that your followers can click through in your post description. Unless you have over 10,000 followers (which most small businesses don’t) you’ll only have one clickable link on your profile. You’ll want to maximise the way you use this link and ensure you’re providing your Instagram followers with the information they are looking for. A special landing page is the best way to do this. 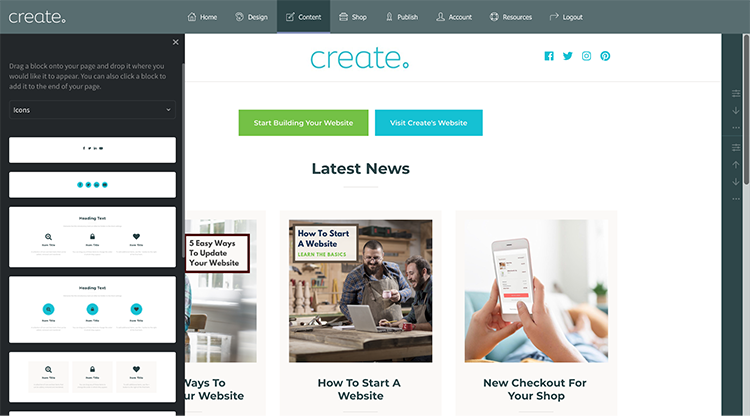 The post below will explain how to build an Instagram landing page using Create’s Website Builder but you can apply the same principles to any web design tools. Before you start building have a think about what kinds of content you currently share on Instagram and look at your last few posts there. What would be good to add to the page? What are your Instagram followers hoping to find? What do you want your followers to see? Why not take a look at the Instagram landing page we have built for ourselves, we’ve added a mixture of blog posts, links to our website main pages and other social media. It’s at https://instagram.create.net. 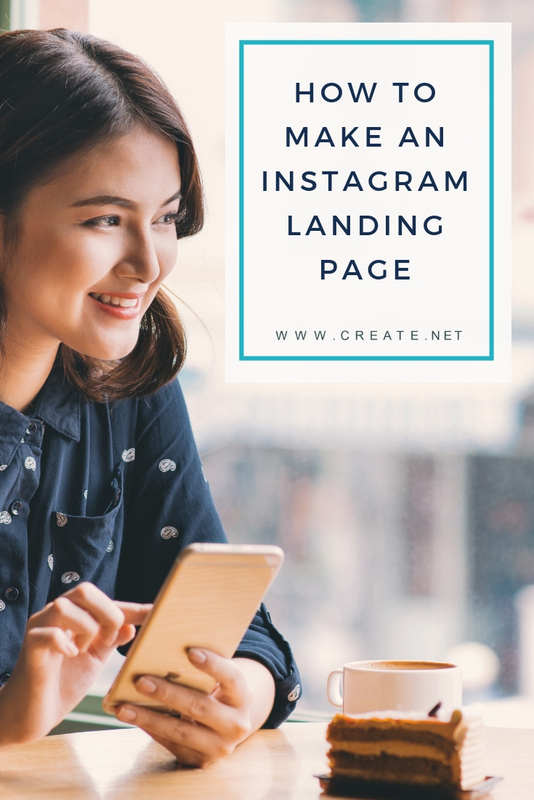 (Our landing page is separate to our own website so we could use our tools and show you how you can easily build your Instagram landing page too). We’re always writing the links to blogs in Instagram posts, knowing that our followers will have to copy and paste it on their phone if they want to read it, so we’ve been thinking about a way to improve their experience. Above is a screenshot of the Instagram landing page which shows you how the page displays on desktop (on the left) and on mobile (on the right). Because you’re building for Instagram visitors they will be mostly viewing your page on their mobiles so you should consider the mobile experience as a priority. 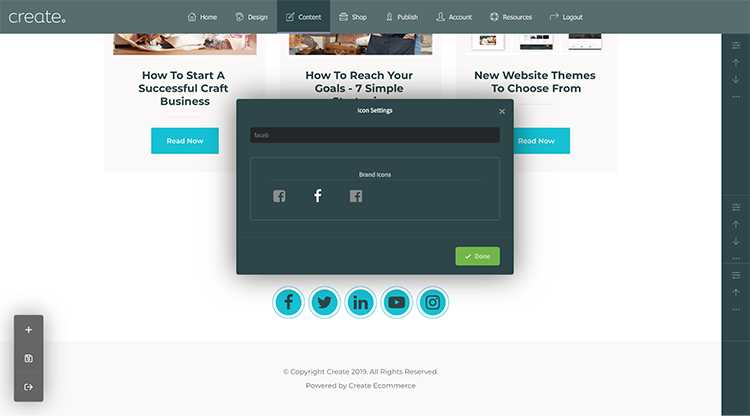 We’ve kept our landing page really simple and included a “Call To Action” block with two buttons that take visitors to our website or to sign up for a free trial. Next, we’ve added content for our latest news and blog posts and then a couple more buttons to get in touch or join the Facebook group. We’ve ended with our social icons to alert Instagrammers that we’re on other platforms. This might encourage them to follow us in more than one place. Set your “Page Filename” by entering the part of the filename before .html. For example you might want it to be "https://www.mywebsite.co.uk/insta-links.html" and should put "insta-links" in the box. Once you’ve set up the page you’ll be taken through to the screen to choose the design preset of the page. For this type of page choosing the “Blank Page” option is best as you won’t need to delete lots of unnecessary blocks. Once you’ve clicked on “Blank Page” the page you’re building will load in with the block selector to the left. The block selector is where you will find all the different types of content you can add to your page. There are lots of block options to choose from so you’ll be able to make a landing page that’s unique to you and the content you’re sharing. 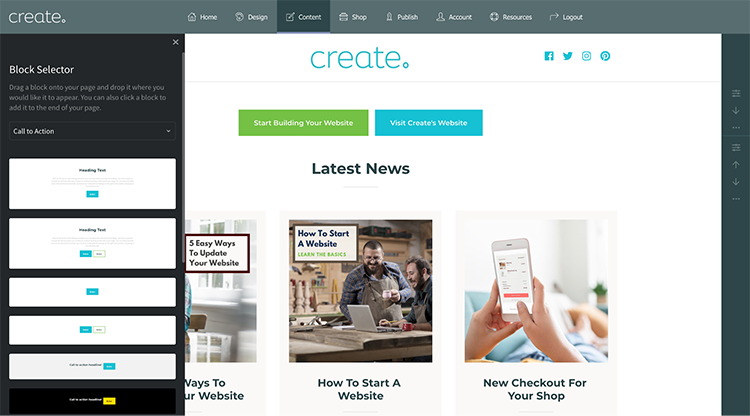 In the next steps, we’ll deconstruct the landing page we have made as an example of how you could build your own page. To set up a button on your website select “Call To Action” in the block selector drop down list. Then choose from the blocks available. 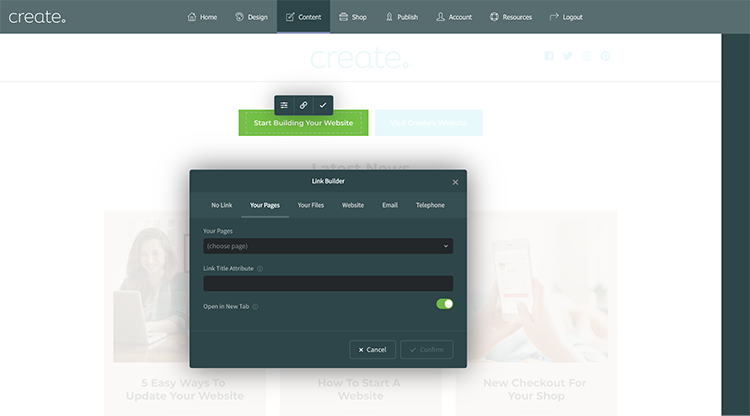 We chose the two button option for our landing page but you might prefer a single button. 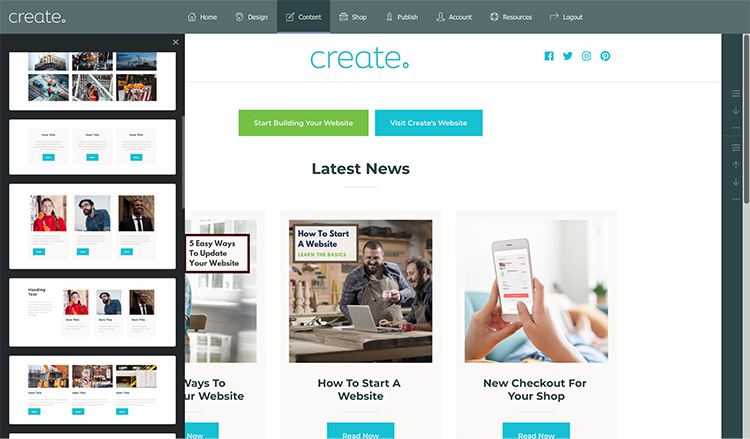 You could keep it really simple and build your whole page with a number of button blocks which take you to different places on your website. This is a super easy option for getting started and easy to update too. Click into the button text and type in what you would like the button to say. Hover over your button to see the settings toolbar appear on it. Click on the link icon on the settings toolbar and the Link Builder window will appear. Select “Your Pages” and then find the page you’d like to link to in the drop down list. When you’ve selected the page you’d like to link to press the continue button in the bottom corner. We share our latest blog posts on Instagram so we wanted to include these on the page, you might want to include some of your products or “New In” shop categories. It could be a mixture of all of these. To display these we chose one of the “Collections” block types. Choosing a collection means all the items will appear exactly the same and you can just add a new one in, drag the order around or delete one when you need to. They’ll flow in a line or appear one beneath the other for mobile meaning it does the mobile responsiveness for you. Select “Collections” in the block selector drop-down list. You can choose a block with or without pictures depending on what content you have to make the page. Once you’ve added the block to the page you should edit the text on each item to what you would like it to say. Then hover over the individual elements to see their toolbars appear. From here you can link each element through to the page you want (use the steps from adding a button above). Make every element a link to ensure you are making it easy for your Instagram follower to click through on their mobile. 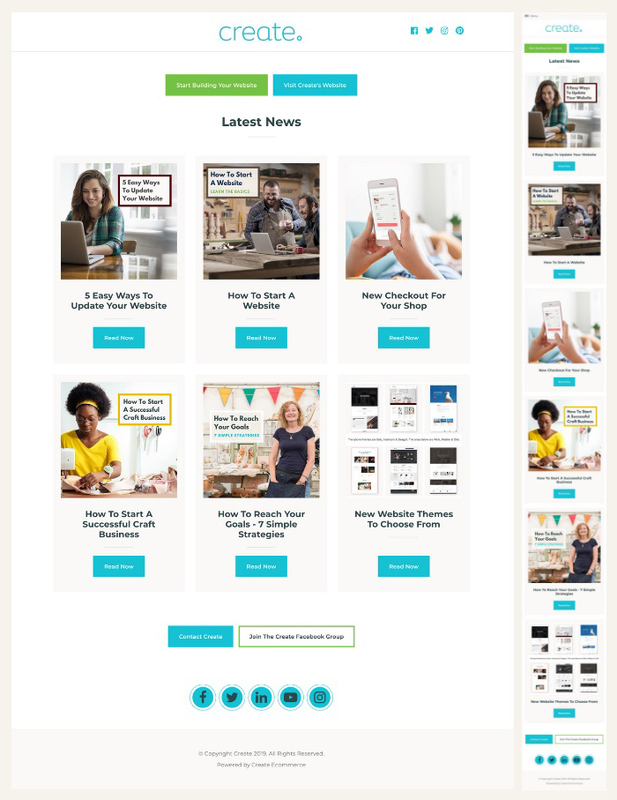 When you release a new product or blog post you can come back to this page and either add a new item to the collection, replace an old one or drag the order around. It’s a good idea to keep the newest content at the top too as it will be more likely your followers will be looking for this. Finally, we’ve included icons for our other Social profiles. This is to encourage visitors to the landing page to come and join us in those other places and makes it easy for them to click through immediately or launch the relevant app if they have it on their phone. Select “Icons” in the block selector drop-down list. Click on the block you’d like. Our landing page has the second option with the larger icons. You’ll now need to set up each icon. Hover over the icons for the Icon Settings toolbar to appear and click the settings option. Click the “Add Item” button to choose a new social icon, use the search to quickly find what you are looking for. Delete any social icons you don’t need using the rubbish bin. 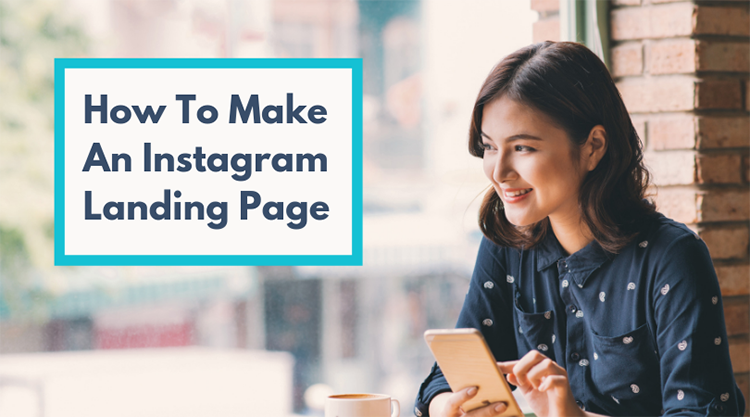 Once you’ve built your Instagram landing page you’ll need to publish your website. Then you can head over to your Instagram profile and update the website link in your profile. Have you built your own Instagram landing page? Share it and discuss in the comments below what’s worked for you.